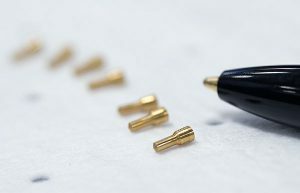 What can be done when the production machines for an essential component have been discontinued and the process simply takes too long? 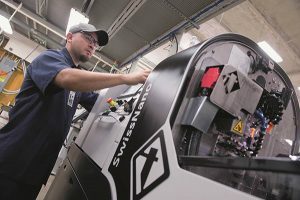 At Schuler Pressen AG, a manufacturer of pressing and stamping machinery, the decision was taken to find a new way of producing gears – using profile cutters. This is where Blum-Novotest’s TC64-Digilog scanning touch probe came into play. The probe enables the examination of the interlocking tooth and ensures that the process as a whole is consistent and verifiable. At Schuler AG, gears for large press drive shafts were in the past produced with the aid of special gear-cutting machines. However, shaping the gears alone takes between 16 and 19 hours. Moreover, the machines are now obsolete. 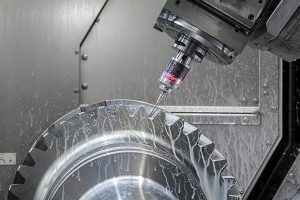 The solution to this issue came in the form of milling the drive shafts on a turn-mill machine using a specially manufactured profile cutter. To reduce handling and improve quality and consistency, the company decided to carry out measurements on the machine. The advantage of the Digilog touch probe is that it can perform both digital measurements as well as analogue scans. This means that it is possible to guide the probe over a surface and register measurement data continuously. Complete cogwheel inspection consist of 144 individual measurements on a slanted track along the whole tooth flank. This includes 36 teeth with two flanks each in both halves of the double helical gear. The entire procedure only takes 13 minutes at a scan speed of 1.8 m/min. During this time, the Digilog touch probe records 570,000 individual measurement values. However, only the linear axes are used during the scan as this then excludes any errors of the rotary axes used for production. 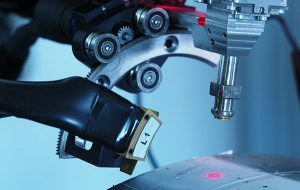 The University of Strathclyde’s Advanced Forming Research Centre (AFRC) has received international accreditation for three laboratory testing and calibration techniques, marking a significant endorsement for the centre’s materials testing and research capabilities. AFRC has become one of only a few organisations in the UK to gain ISO 17025:2005 for measuring the geometry and dimensions of parts with a CMM. Similarly, the centre is one of only a small number of places in the UK to be accredited to ISO17025 standard for measuring residual stress in engineering materials and components using both X-ray diffraction (XRD) and incremental central hole-drilling (ICHD) methods. ISO 17025:2005 is the AFRC’s third accreditation, adding to its ISO 9001 and BS18001 certificates. The former recognises the centre’s ability to meet customer and regulatory requirements, while the latter assures a high level of health and safety. 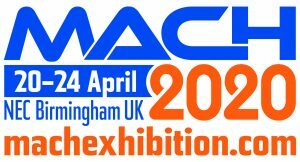 Dr Salah Rahimi, principal materials fellow at the AFRC, says: “By achieving this international standard, our expertise in materials research has been recognised at the highest level. 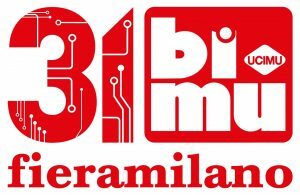 It underlines our commitment to advancing our research in this area and further develops the trust our customers place in us to work on their projects. 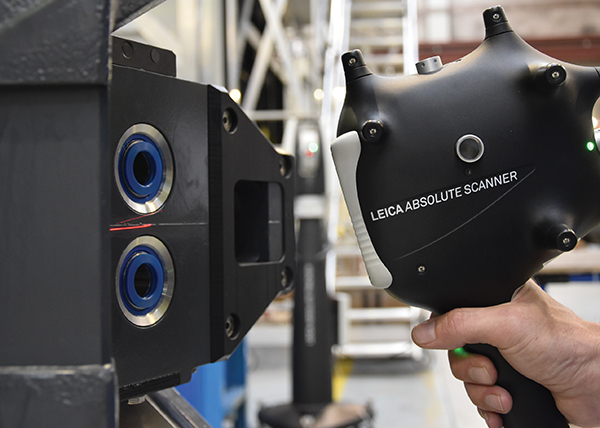 Hexagon Manufacturing Intelligence has launched the Leica Absolute Tracker AT960-SR, a lower budget addition to the AT960 range of laser trackers. Only available as part of a bundle offer with one of Hexagon’s laser scanners, the AT960-SR is designed for applications with smaller measurement volume requirements that still demand the speed and accuracy performance of Hexagon’s flagship laser trackers. over a measuring range of up to 10 m in diameter for six degrees of freedom (6DoF) measurement, corresponding to a measuring volume of approximately 400 cu m.
Hexagon’s Leica AT960-SR is available to order worldwide from October as part of a bundle featuring a Leica Absolute Scanner or Leica T-Scan 5 hand-held laser scanner. Faro has launched its Visual Inspect product family that allows large, complex 3D CAD data to be transferred to an iPad and used for mobile visualisation and comparison to real world conditions. This enables real time, actionable manufacturing insight through earlier stage error detection in the production, construction or design processes. 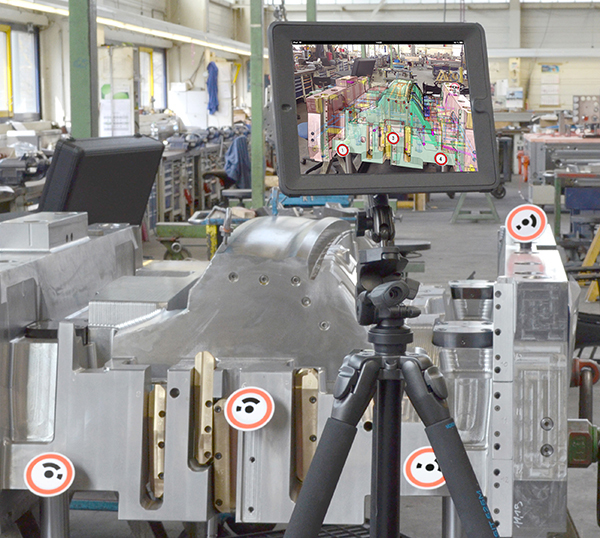 Visual Inspect is being described as a next-generation solution as it moves 3D CAD viewing away from the traditional desktop PC to a mobile ‘in hand, on demand’ system. The 3D CAD data is stored locally on the iPad through a compressed, mobile format which provides a high degree of flexibility and mobility that together drive increased productivity, says Faro. The end user is able to document problems and errors with text and images and then export both into a Microsoft Excel office document. The product family is available in two options: Visual Inspect, which enables mobile viewing, verification and documentation of complex 3D data; and Visual Inspect AR, which allows complex 3D data to be overlaid and compared to actual data in real time. Visual Inspect can be ready for use via a simple three-step process that includes first downloading the iPad application from the Apple Apps store, calibrating the iPad and then activating the application with the calibration file. When William ‘Bill’ T Cox Jr talks about his business, the conversation turns naturally to the Cox Manufacturing Company’s strapline ‘Cox delivers confidence’ – and it is technology from Tornos that helps him make good on that promise every day. 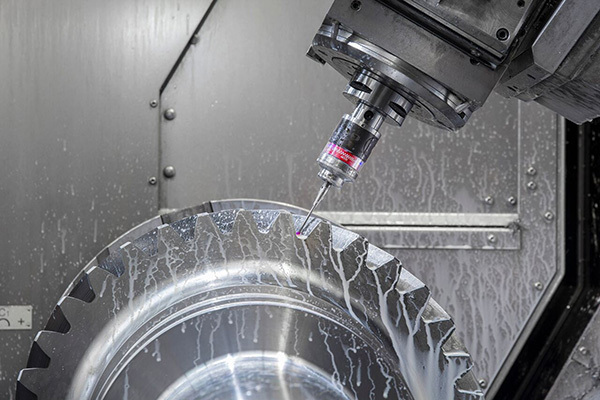 Situated in San Antonio, Texas, one of three metropolitan Texas cities that make up the Texas Triangle region, Cox Manufacturing specialises in custom screw machine products and CNC turning. The company’s customer-centric legacy began in 1956, when Cox’s father, William T Cox Sr, founded the company and started making bobbins for early computer memory systems. 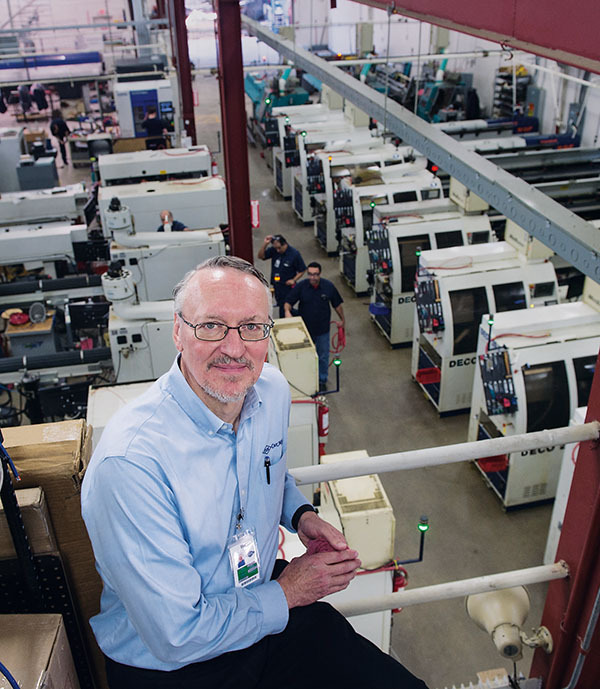 Cox Manufacturing was founded with his father’s bold bid to start “some sort of manufacturing company” after coming across a Swiss-type screw machine at an auction. Though he had limited knowledge about the machine and knew next to nothing about automatic screw machines and Swiss automatics, Cox was passionate about manufacturing and had a prowess for solving engineering problems. 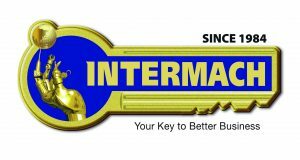 Those were the cornerstones on which he built a business that has become a leading supplier of precision machining services throughout the US southwest. Today, Cox Manufacturing supplies high-volume, tailor-made components for some of industry’s most discerning customers in the aerospace, automotive, trucking, defence and medical technology sectors. Bill Cox’s commitment to the family business began early. After his father’s sudden death in 1968, when he was just 12 years old, his mother took him aside and explained that Cox Manufacturing’s biggest customer was interested in buying the business. Was he interested in someday running the business himself? His answer was an emphatic, “yes,” and he was off and running in his quest to learn everything necessary to continue building on the foundation his father had established. He quickly learnt to read financial statements and joined his mother in meetings with bankers, lawyers, accountants and contractors. After attending Texas A&M University for two years, just long enough to take the courses that would serve Cox Manufacturing and its soon-to-be growing customer base, the 20-year-old Cox began working full-time at the family business. 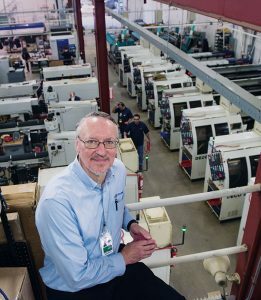 When he joined the business full time, Cox Manufacturing was using Bechler and Index machines, as well as some Swiss-type machines and Index single-spindle cam machines, but Cox was looking to the future. He began buying up used Tornos Deco machines and today owns more than 30 of them. Cox Manufacturing took a big leap in 1980 with its move into a new building constructed on land that Cox and his mother purchased when he was still in high school. More recently, Cox bought a new Tornos SwissNano, which is turning out to be a perfect fit for his business. As a result, this visionary entrepreneur already has his eye on further SwissNano purchases.